To celebrate the 30th anniversary of this iconic models first appearance, Tamiya have re-released the Holiday Buggy on the modern DT-02 chassis. The classic California style Holiday Buggy has been brought bang upto date buy mounting it on the proven DT-02 2WD chassis. The DT-02 bathtub chassis has its battery loaded in the centre for ultimate weight distribution and balance. The gearbox is completely enclosed to protect it from interference by dirt and debris. With 4 wheel independent suspension, it displays excellent handling even on rough surfaces. 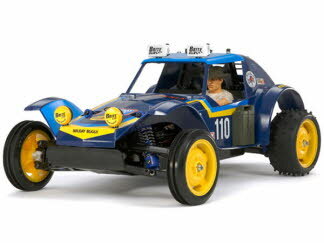 R/C fans will definately rejoice when they see this nostalgic body shape and relive the fun with the modern mechanics.